The Inside Scoop where authors talk about their journey to publication featuring Sue Whiting whose most recent book is Missing. Sue was Publishing Manager and Senior Commissioning Editor at Walker Books Australia for ten years, before leaving in 2016 to concentrate on her writing and to work from home as a freelance editor, writing coach and mentor. How I Promote My Book with ideas from Tania McCartney. Tania is an experienced magazine and book editor, independent publisher, features writer and columnist with 30 years experience in magazines and publishing. She currently has 40 books in print or in production. 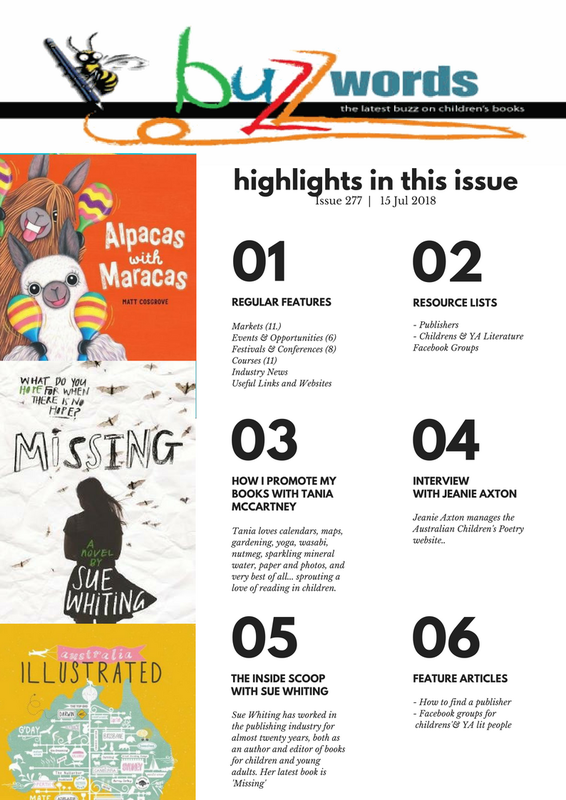 An Interview Jeanie Axton, manager of the Australian Children's Poetry website. An article on Facebook Groups for Children’s and YA Literature People by Sandy Fussell. Sandy is the internationally published author of 14 books for children including the Samurai Kids series. She is also an ICT consultant, systems analyst and edits an e-newsletter called Writer Tech. and the the usual segments of industry and award news, useful tips and resources. This issue we're highly recommending Jane Friedman's a middle of the year look at how 2018 is shaping up publishing wise. What is trending? Who stays strong... and what really is going on in the back lists.